My black n gold needed a partner. Got a Roto Grip Halo, Drilled this one long n strong but sanded solid. first night of league using the Halo. Took me half a game to find solid pocket, moved 5 left from shadow. From shadow practice to game three, I was over left 12 boards total, few boards left before I'm pressed on the ball return. This ball is solid 8-10 left of the black n gold to make solid pockets. It hooks and as long as I don't lay it flat it will hit the pocket. The ball did better missing right 2-3 boards of break point vs missing left. Break was around 7-8. I'd have to miss 3-5board left to find enough oil to slide near the pocket and not punch the face resulting in splits. Still learning but threw an average night in the end. 167, 210, 213 (ave 187). I still had some near pocket splits with the halo, fix was moving a board at a time and Swing it while that line held. Speed was consistent 16mph thru the night I didn't try to transition to the black n gold. I wanted to learn this ball and how it break down without much traffic on this line. Friday night was a position night and we entered technically 1st in a 3 way tie for 1st based on total pinfall. I misread the lanes a little in practice and thought I needed to play more direct. Using my Super Natural, I struck the first two frames but left a pocket 7-10 I on the 3rd which had me doubt the reaction I was getting. I tried switching to the Turbo which struck nice in the 4th, but I then left two straight 10 pins. Made them and switched back to the Super Natural as I wasn't happy with the 10's and it went high for a split. After that I finally moved to where I had been playing the last few weeks and was lined up the rest of the night. I salvaged a 183 the first game and finished strong with a 237 and a 245 for a 665 series with no opens after the 1st game. I'm still very happy with my spare shooting, I've missed one single pin in the first 7 weeks. Fortunately after a rocky start the team pulled off a 1 pin win the 1st game and won big the 2nd. They rallied late in a close 3rd game so we took 5. The 3rd team in the 3 way tie got swept and the team in 4th was only 2 points behind the 3 way tie so now we're tied for 1st with the team that was 4th before Friday. The 3 way tie for 1st had me thinking about a question. Our bylaws have a 3 game rolloff for first place in the possibility of a tie. What happens if there was a 3 way tie going into the rolloff instead of just the position round? I'd think that you would need to get all 3 teams on the same pair or there could be a perceived advantage. I don't think doing a small stepladder would be right since I don't think seeding by pinfall and having one team only need to win once is right either along with needing to spread it over two weeks. Just curious, the odds of this happening are unlikely. at the end of last year, there was a possibility of 8 teams to reach the final bracket spots. We had a meeting and decided to have a 1 game rolloff to break ties. although the first 3 teams were solid, the final 5 places in the top roll off bracket was up in the air among 8 teams. There was only need for a 1 game rolloff for the the 8th place. Top bracket was guaranteed $300 more then the second bracket. So, it was important. 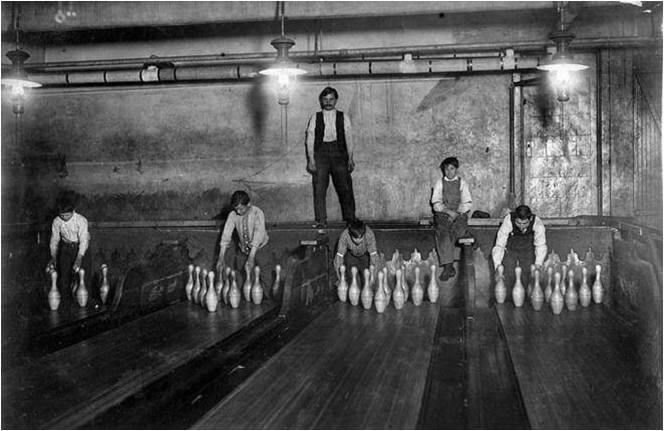 I'm not sure what they did to the lanes on Monday. But, they announced it would be like the new recommended pattern and volume. Not sure what that is. Anyone have any insight on that? I found the lanes to be less snappy. The ball carried longer with a very controllable arc, to me. Others commented that there was a lot of oil, which I didn't notice. It was just laid different to me. those that swung the ball were more inconsistent. I stood 32, rolled out to the 8 board at the break, which was 45 feet. And, it came back nicely. The entry angle was not as severe and I carried high hits better. And, NO 10 PINS. I found that on high hits, the ball didn't go thru the head pin, but rather straight to the 5. 658 was reasonable, after my dismal start. My down range target is the reflection of the 6 pin on the lane, and I can't tell you what arrow I roll over, probably between 13-15. As, I focus downlane. My old house had range finder marks, and I got used to looking far downlane. This house doesn't have range finders, so it takes a little adjustment. A little bit of everything last night except for first-ball gutter balls and split conversions. I'm proudest of my clean second game, and no missed single spares all night. Steve was absent, and the team only won the second game. After breaking 700 a few weeks ago haven't been able to get back there in any of my leagues. Feel like I'm throwing the ball better than ever but still not quite lined up and not getting quite the motion I want down the lane. But I've avoided having really bad series and I'm able to at least avoid bowling under 600. Had 626 on Sunday and 615 last night. Tonight though couldn't have asked for a worse start. 1 strike in the first 5 frames and 3 flat 7s. Flagged one then tried to adjust to hit higher in the pocket and went high for a 2,4,7,8. Couldn't get the 8 out on the spare attempt. Then a split and a 3rd open, sitting at 120 after 8. Struck in the 9th and had a chance to salvage 180, but moved in a bit to adjust off the last shot and went pocket 7-10 for a lousy 146. The nadir of the season for me right there. 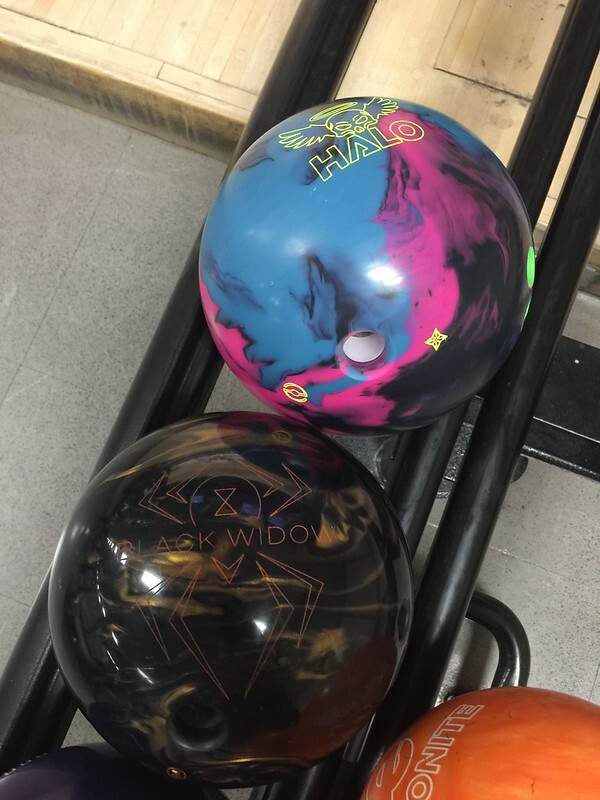 Using a ball that I know works at this house (DV8 Alley Cat) and really nothing else in my bag that I felt comfortable going to. So instead tried a hand position change to get my track closer to the thumb hole and not have the ball come off the pattern so violently so I can play my down and in shot and importantly not get punished for trying to give it a little extra at the end. It worked. I targeted the 9 board the rest of the night, focused on not bellying it, and the ball came off the pattern nice and smoothly and went through the pins. Put together my two highest games of the season: 268 and 267. Ended with 6 in a row in the 2nd game and started with the front 7 in the 3rd before leaving a flat 7 (just a little bit outside). But really happy with the comeback. I wasn't sure how league was going to go last night after practice. I threw my first shot with my Super Natural which hit solid for a nice strike but then I moved to the right lane. I had already noticed that my ball came back quite wet after my shot on the left lane and it hardly moved at all on the right lane. This continued for a few more shots, OK on left, hardly moving on right. It wasn't just me either, everyone was having trouble on the right lane and the left lane was sketchy too. 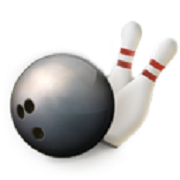 They had a bunch of bumper bowling right before our league, gotta love carrydown. I switched to the Turbo in practice and had an OK first game for a 214 with an open in the 9th frame for a 3-10 (only open of night). That was on the right lane which had finally started to break down. We somehow won that game, my anchor struggled a lot and shot 80 pins below average that game. The rest of the night, I was really lined up, I shot a 278 the 2nd game with a converted 3-10 in the 3rd frame. My anchor bowler came back the 2nd game to beat his first game by 140 pins. I finished the night with a clean 233 for a 725. We took all 7, the last two games were both close in the 10th frame. a solid night for me, last night, 214-204-200. Was very consistent in my release, and spare shooting is easier when you only leave a pin or so. But, for the 9th time in 10 weeks, we bowled short handed. the work travel schedule is killing my team mates. 7 on the roster and can only get 4 in a 5 man team. Today in Sr League, it was a disaster. on the end pair of 39-40. You couldn't find 2 different lanes in the house. 40 hooked and 39 was slick. I finally used 2 different balls after the 5th frame of game 1, but still had trouble. Shot 144 in game 1 and 137 in game 2. And, I was high man in game 1 and second in game 2, where a 159 was high. The lowest average on our team is 175. We were bowling against a team of "not so good bowlers". Gave up 151 in cap per game. Lost the first by 80 and the second by over 100. Finally, won the last game.